My husband's ideal day would be to be on a boat in the open sea.. our boat is on a lake that is too far for us to enjoy. Our Crumb Cake card stock (#120953) is the ideal base for this Epic Day This and That (#130814) Designer Series Paper. 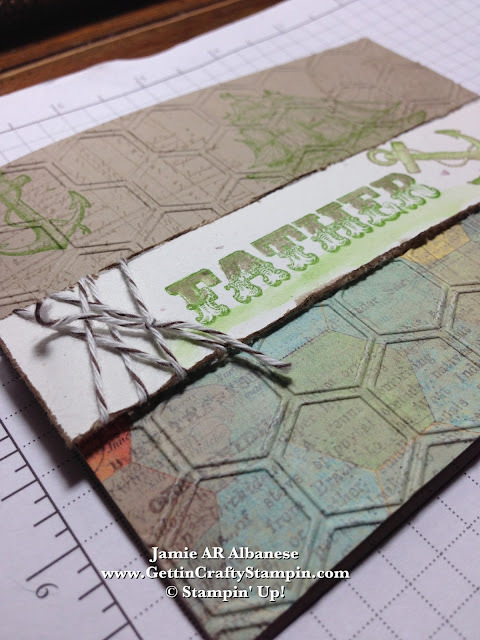 The Map print in the honey comb pattern lent it to the Honeycomb embossing folder (#129378) and Big Shot (#113439). This Father stamp is from Amazing Family (#131907). 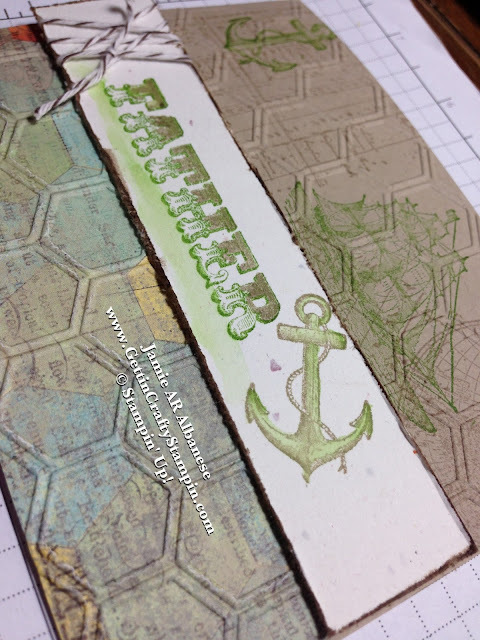 Stamping it with our Gumball Green ink (#126861) on the Naturals Ivory card stock (#101849) for a vintage and natural look. Our Crumb Cake Stampin' Write Marker (Neutrals Stampin' Write Marker collection #131261) make it easy to accent the top half of the word. This allows for an easy coordinating vintage look. Tie it up... with our Early Espresso Baker's Twine (#123124). 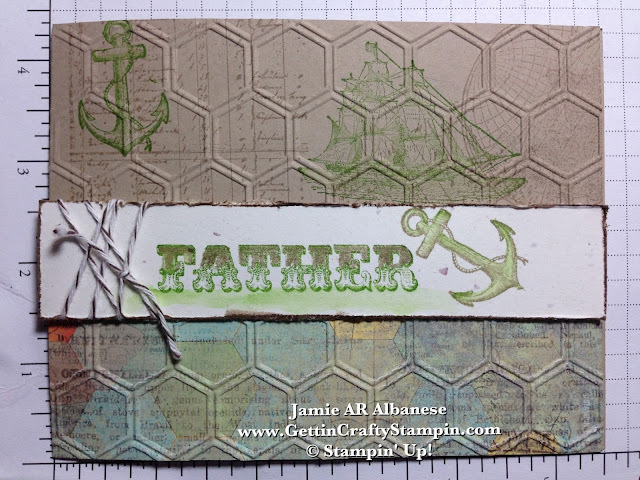 Distressing the edges with our Stampin' Distress Tool (#127562) and then rubbing the edges with our Crumb Cake ink (#126975). Our The Open Sea (#128454) stamp set is uber vintage and masculine. 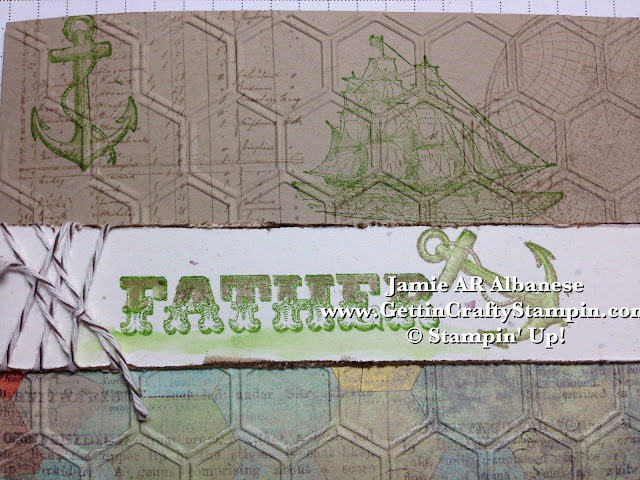 Stamping with Crumb Cake ink (#126975) and our Gumball Green ink (#126861). The Aqua Painter pens (#103954) allow me to pull ink from a stamp pad and add color.. The Anchor stamp reminds me of vintage naval tattoos... I like the masculine and strong look of it. It mimics the strength a good father will have. any man would love to receive this for his Father's Day! The vintage looking paper is sure to have love written all over it. Myyyy Dad and Pappa are now in heaven... I know that my husband is sure to enjoy this card. Now, hmmm... my Father-in-law... hmm... lol. Take a moment to celebrate those in your life! 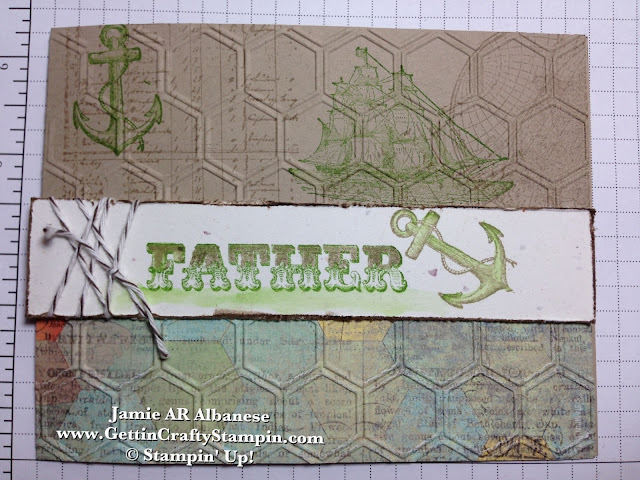 CLICK HERE to see all of the New Stamps, Papers, Tools and MORE - just released this weekend!! Please leave me a comment and let me know what you think... pin, tweet, email and Facebook me... remember that you can follow me on all of those avenues as well as YouTube, Instagram, LinkedIn and more!! Let's take time to walk through life together! !